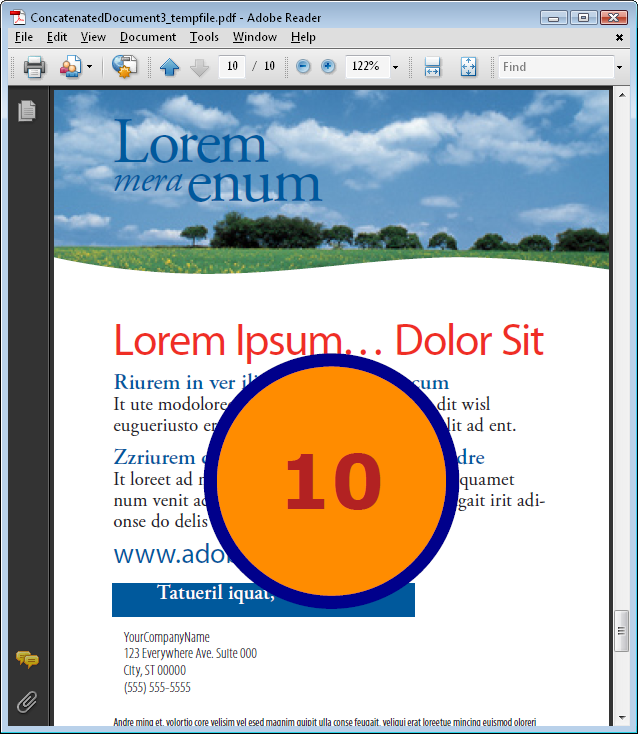 This sample shows how to concatenate the pages of several PDF documents to one single file. When you add the same external page twice or more, the content of the pages is shared. Each imported page can be individually extended with graphics and text. /// Imports all pages from a list of documents. // Open the document to import pages from it. // ...and add it to the output document. // ...and start a viewer. // Show consecutive pages facing. Requires Acrobat 5 or higher. // ...and add them twice to the output document. /// This sample adds a consecutive number in the middle of each page. /// It shows how you can add graphics to an imported page. // Note that the output document may look significant larger than in Variant1. // uncompression of its content if it was compressed in the external document. // or uncomment the following line. // content set 'Append' to 'Prepend'. /// of Variant3 and Variant4. // For checking the file size uncomment next line. // ...and add it twice to the output document.